If you're searching the great taste of a banana cream to make subtle banana cake vape juice recipes, you've just found it! - Banana cream in e liquid ! What are we talking about ? Liquor or a dessert cream? I'd like to try it in DIY but what to expect? - No, you will not find the taste of alcohol but rather a ripe banana in a smooth cream, a subtle recipe that makes a realistic fruit e juice. You will make a lot of recipes with this flavor! Arom-Team review: Do not forget that this is a cream and, by definition, a sufficient steeping time is necessary for this flavor to develop itself. A sweet banana taste but not too much, to dose in moderation not to distort it. 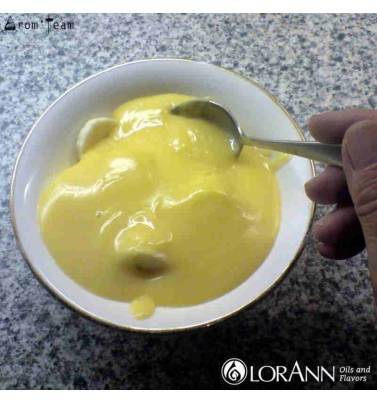 This LorAnn aroma is flavorful, it is enough to smell it to perceive it. Awesome banana cream flavor that does not make us lying, being one of our best e juice flavors and pairs very well with a hint of Bob'Passion now reference in vape world ! Is this banana flavor only for electronic cigarettes ? 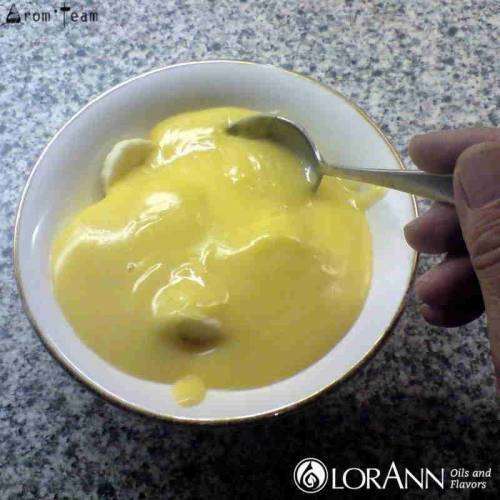 All LorAnn flavors are food grade and this banana cream is widely used in pastry making. 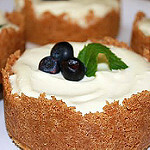 Applied to the ecigarette, this flavor allows to make creamy liquids, with a natural taste, sweet as a banana jam. How much lorann oil to use in e liquid? What is the steeping time for a banana custard e juice ? The fruit flavors do not require a very long maturation time but here it is a cream. Give it a two weeks steep.